Ross Kennedy shares his keys to successfully inducting new contact centre advisors to help you move away from your standard “one size fits all” induction process. Bringing new people into your contact centre can be an exciting time. For them there is the excitement (along with trepidation) of a new start, new challenges, responsibilities and relationships. For the contact centre, it’s the opportunity to introduce “fresh eyes”, new skills and experiences into the organisation, creating more capacity and continuing to build a positive culture. Don’t rely on accidental success. If you can have accidental success then accidental failure is also a possibility. “What’s that got to do with inducting staff” I hear you say? It’s relevant because we don’t often build success into our induction process. It’s often assumed that if we do a good job in the recruitment phase, then it follows that the person will just work stuff out themselves after a basic induction, and everything will be fine. The problem with that approach is that it just doesn’t work any more. In 1960 that approach was probably just peachy, but these days the workplace is a little more sophisticated, people move jobs regularly, and managers need to be much more mindful and involved in supporting their staff. The fight or flight response is our body’s natural response to stress triggers. In a stressful situation, the body does a whole lot of neat things to prepare us for running away really fast or facing a dangerous situation. One of these things is to divert resources from our cerebral cortex (which is where language, abstract thinking and problem solving is done) to our limbic system (our ‘lizard brain’, which deals with emotion, aggression, instinct and reflective movement), so we actually become less smart for a time. How often do we come out of an interview and immediately think “why didn’t I say this or that?” The reason is that the stress you experienced during the interview resulted in your brain not working very well at a higher level, because it was busy getting your body ready to run away or fight. Once the stress is over, we start to function better and with that comes mental clarity. Anyone starting a new job experiences some level of stress, whether they are a trainee or the new CEO, and that stress is going to be around for a few days or longer depending on the circumstances. Is sticking trainee advisors in a room on day one and throwing a lot of information at them going to achieve much? I would suggest that it won’t, because the low-level stress is impacting on them in a subtle yet important way. The reality is that until your new person is relaxed and calm, a lot of that incoming information won’t stick. The reality is that until your new person is relaxed and calm, a lot of that incoming information won’t stick. Once I realised that this was happening (partly through observation of my own behaviour in new situations), I changed my induction programme to see if I could work around the problem. While it is important that new staff get the half-hour basic induction (there’s the toilet, if you smell fire run down those stairs! etc. ), after that new recruits should be introduced to their team members and left there for a bit. Basically – get the new recruits interacting with the rest of the team as quickly as possible. Why? Because after a couple of days with the team, they’re relaxed. By that time, the new person has started to form friendships, knows their way around the office, has seen how the work gets done and has been exposed to various systems and processes. So when they enter the training environment, they can ask relevant questions and already have some exposure to the work content. DPD’s contact centre in Birmingham does this very well by running recruitment days instead of holding classic one-on-one interview sessions. These include a tour of the contact centre, unsupervised Q&As with current advisors and more. By doing this, DPD can ensure that new recruits get a feel for the culture and job familiarisations – which has increased in-training drop-outs, but has significantly improved short-term attrition. It also gives the team a chance to get a feel for the person and their values before they start working full time. So, we recruit Jane as an advisor. Her CV is excellent and demonstrates that she has the skills and experience we’re after, and during the interview she came across as switched-on, focused and capable. We like Jane, we offer her the position, she accepts. Job done, everyone’s happy, high fives all around. Then, we get back to the ‘real work’. Step forward a little while in time and we find Jane floundering. Her work isn’t at the standard we would have expected, there’s a bit of absenteeism and Jane doesn’t seem engaged; sometimes she does things in an ‘odd’ way. In short, she doesn’t seem to be ‘fitting in’. We don’t understand this because Jane has a great team leader, there’s technical support available and other people in her team are all performing just fine. There weren’t any indicators in the recruitment or induction process. So, what went wrong? Sometimes the reason is entirely outside of our control; people just have things going on in their lives that impact on their work. Having managed staff with mental health issues and several that were victims of domestic violence, I can attest to how difficult those situations can be, for the staff member, the manager, and often for the rest of the team. Sometimes, just supporting them enough to function at a basic level is difficult, much less having them work at a high standard. However, if we assume for a moment that this person is just not engaged, we need to find out why. Unfortunately, if a manager does do something (and many are missing the soft skills necessary to do this properly), it often comes out as an attempt to work out what ‘the person’s problem’ is, instead of what the ‘actual’ problem is. And here’s where designing some success into the process can help. Give new advisors a buddy. One of the problems with the hierarchical nature of organisations and some contact centres is that it creates an artificial barrier. One of the problems with the hierarchical nature of organisations and some contact centres is that it creates an artificial barrier. We place people more senior to ourselves on an invisible pedestal, and often fear interacting with them. So, despite Jane having a great team leader, she may not have the confidence to ask some of the burning questions she has because she doesn’t want to appear stupid. The result may be that Jane doesn’t get to know the culture and instead reverts to her natural behaviours, which may or may not work within the existing culture. You can get around this by assigning new staff a buddy and introducing them on day one. Develop a brief ‘job description’ for the buddy and make sure that they are aware of their responsibilities when they get assigned. Their job, in brief, is to introduce the new person to the culture from a peer’s perspective and support them through their first three months of work. Who do I speak to if …? You get the idea, it’s all the stuff that isn’t about direct line supervision or technical ‘stuff’ (usually the team leader’s or manager’s job). It’s good practice for the buddy to start the relationship by setting up a weekly meeting outside of the office (go for coffee, get to know each other, talk about stuff that has nothing to do with work). The casual nature of these get-togethers is designed to allow the new person to relax and the relationship to form. Having a peer introduce them to ‘this is how we do things around here’ will be much more successful than just having a manager explain the culture. Because this information is coming from a peer, it’s clear to the new person that certain behaviours are the accepted practice, not just something that ‘management want’. To find out how to develop the best possible culture type in your contact centre, read our article: What Is the Best Model for Contact Centre Culture? One of the problems with standard induction processes is that they’re standard. Seems like an obvious statement, right? What I mean is that standard processes don’t take into account that people are different and learn in different ways, and therefore applying the same induction and training process to different people is not going to give you a standard result. Applying the same induction and training process to different people is not going to give you a standard result. If you have a monkey, an elephant and a fish, and you’re teaching them how to climb a tree, then two-thirds of your students are going to fail. I’ve had a 17-year-old whizz-kid who was on the phones within an hour of starting in the contact centre centre I managed (because he was bored with double jacking with one of the experienced agents already!). I’ve also managed a stay-at-home mum who hadn’t worked for 16 years and needed a fair degree of hand-holding to start off (and proved to be an absolutely fantastic employee!). In between those extremes come all of the others, with different learning needs and styles. Some are visual learners, others are aural learners and then there are those that learn by doing. The problem is our induction process is often so compliant and consistent that it lacks any flexibility. In some organisations it has been the same for years, and often consists of sitting in a room being taken through a bunch of screen dumps showing various systems, by a training officer that is not an experienced operator. They often cannot provide real-life examples and themselves may have never used the system they are teaching. Of course, there’s plenty of switched on learning and development (L&D) people out there who live this reality every day but still manage to make the training interesting and enjoyable. This is often by providing it in different formats (some hands-on, some visual, some text, etc.). With this in mind, divvy up your induction programme into components for L&D, components for a technical trainer (or perhaps experienced staff members) and some time working with other people for a few hours at a time, away from the training room. Also, as a manager, spending time liaising with the L&D team during this initial induction is time well spent, as you can use it to talk about what you have learned about each of the new inductees. That information is useful to you, so you know what you’re getting at the end of the induction process, while it will also provide you with insight as to how to modify the induction process for the future. If we have someone who reacts better to being hands-on then we can arrange more time ‘doing’. However, if we have a visual learner, we can spend more time ‘showing’. The end result is a person who leaves induction ready and able to become part of our team and get stuck into the work in a positive and enthusiastic manner. Contact centre inductions are not a ‘one size fits all’ process. 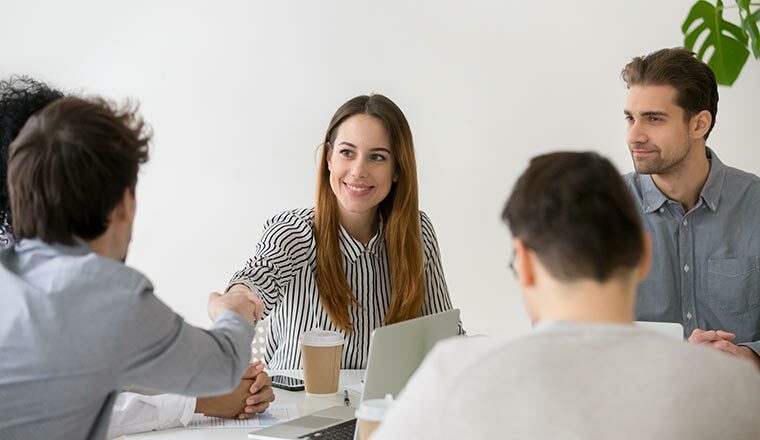 There’s plenty of ways to introduce new staff into your organisation, and with just a bit of tweaking the process can be tailored to suit each person without much extra effort. The intention is to have that person up and running in the shortest period of time possible, and to be operating effectively within the existing culture. So, take some time to look into your induction process and see if there’s anything you can do to design some success into it. You might be pleasantly surprised by the result. How do I ensure a successful recruitment strategy? How do I Ensure a Successful Retention Strategy?